FPW 2018: Look. Listen. Learn. “Look. Listen. Learn.” is the theme for this year’s Fire Prevention Week, with the tagline “Be aware. Fire can happen anywhere.” The National Fire Prevention Association’s (NFPA) goal is to encourage people to take fire safety seriously, and to help them stop assuming that fire-related emergencies are rare, and therefore unimportant. Each part of the theme addresses a different area of concern and suggests specific action items to better prevent fires from occurring. “Look” asks the public to identify the places a fire could start around the home. What does this mean? 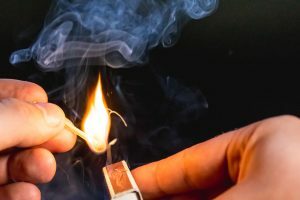 The NFPA lists five specific hazards: cooking, heating sources, electrical/lighting sources, candles, and smoking materials. We have addressed cooking safety in the past, as it is responsible for almost half of reported home fires. The most important thing is to stay close to the kitchen and never leave your cooking unattended. Heating sources are a common problem during the cold weather. The best way to keep heating sources safe is to clean them regularly and position them with care. We explained the dangers of electrical equipment and candles in our post about Christmas decorations. As with heat sources, the location and upkeep of these things makes all the difference when it comes to safety. Finally, smoking materials need to be handled with care and extinguished with the greatest attention. “Listen” stresses the importance of being aware of the smoke alarm and acting immediately when it sounds. Make sure there is a smoke detector in every bedroom and on every level of the home. It is a good practice to have a smoke detector near the doorway of each room, to have at least one positioned in the middle of each hallway, and one in other areas of frequent use, such as the kitchen and living area. Test smoke alarms once a month, and replace them every ten years. It is highly recommended that the smoke alarms all connect so they go off simultaneously, therefore alerting the entire house as soon as the danger starts. “Learn” recalls last year’s Fire Prevention Week theme: “Every Second Counts, Plan 2 Ways Out!” There is nothing more important than creating a thorough escape plan and reviewing it regularly with the household. According to the the NFPA, though the rate of home fires is declining in the United States, the likelihood of dying during a home fire is increasing. People may be more aware of the need to invest in fire prevention equipment, but are still dangerously unaware of how to respond when a fire happens. In addition to creating a careful escape plan for the home, it is also important to assess your surroundings when you are elsewhere. Immediately identify the exits and make sure you know at least two clear paths to safety. It is impossible to over-emphasize the importance of following the safety tips and procedures outlined in this article. Choosing to prepare ahead with the proper amount of care can literally save lives by preventing fires before they happen and increasing the likelihood that you and your family will be safe if they do. We have addressed many of these safety topics on our website in the past, and included the links throughout this article. For the rest of the week, we will be posting daily about other ways you can follow the “Look. Listen. Learn.” theme this year, so be sure to stay tuned!